The Vehicle Identification Number (VIN) provides information about a vehicle’s background, including the manufacturer, model year, and where it was built. In other words, it records the vehicle’s identity. VIN decoders assist dealerships to help verify, analyze and research the information contained in the VIN. Autoxloo’s VIN Decoder provides decoding of the vehicles Year, Make, Model and Trim. It captures all relevant information with our VIN explosion capability. The operation is simple. Just enter the VIN number, click decode, and you’re done. Enjoy received information. Instant online VIN report information on your screen. To get the most out of your data, it must be real-time to allow you to react in real-time. You can easily use our application Upload Wizard, which allows you to upload vehicles to your Inventory. It’s possible to fill in all car information in less then 5 minutes, all with the help of the VIN Decoder. You can also upload a great amount of images with just a few mouse clicks. Fast and easy. In addition the VIN Decoder is available in the Vehicle Inspection Report™ module. Vehicle Inspection Report™ helps to upload the vehicle and save the most actual information about its condition and upload multiple photographs with comments. With VIR™ you can give a full description of the vehicle its exterior, interior, drive train, exhaust system, electronics and frame. Take advantage of Slingshot Mobile™ application. Uploading vehicles into your inventory with a phone or tablet becomes even faster! 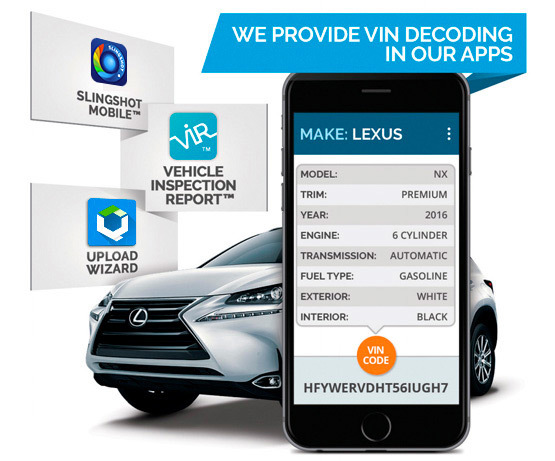 Slingshot Mobile™ application works by scanning and decoding the VIN number for each vehicle. After the VIN is decoded you can take pictures and fill out all important information about your vehicle. VIN Decoder is a simple solution that saves your time, you don’t have to learn how to use any new tools. Having access to the right data gives you a bunch of opportunities. Don’t miss out!